There's a pretty good chance your dog will get injured at least once or twice in his life. Dogs are often adventurous and some are even fearless. Most dogs explore the world barefoot and uninhibited. Unfortunately, the world is full of things that can harm your dog. Accidents happen; do your best to be prepared for them in advance. Whether minor or serious, it's scary to see your dog get injured. Be sure to seek veterinary attention as soon as possible after an injury occurs. Keep your vet's phone number and an emergency vet phone number nearby so you can call for advice and assistance. Depending on the severity of your dog's injuries, you may need to administer first aid. Even if everything seems fine, it's important to take your injured dog to a veterinarian for assessment. Here are some of the more common injuries seen in dogs and how to deal with them. Trauma is one of the most common medical emergencies that affect dogs. A major trauma can cause multiple injuries to the body, both internal and external. Being hit by a car is a frequent cause of major trauma in dogs. After getting hit by a car, many dogs suffer head trauma, bone fractures, joint dislocation, internal injuries like bleeding and organ trauma, skin wounds (often called "road rash") and more. Falling from a height or being in a car during an automobile accident can also cause traumatic injuries. To prevent these type of traumas, be sure to keep your dog on a leash when outdoors and never allow him to roam free. Use a gate or another barricade if you have a balcony and avoid leaving windows open when you are away. Keep your dog safe in the car by using a restraint. If your dog experiences a major trauma, you may need to administer first aid on the scene. Then, get your dog to the nearest open veterinary office. It may be best to try to go straight to an emergency veterinary hospital if there is one nearby. They often have the necessary resources to treat major traumas. If your dog is in a fight with another dog, both dogs may sustain serious injuries. Generally, dog fights and dog attacks cause wounds to the skin and soft tissue. These wounds range from minor to severe. A dog's teeth cause puncture wounds and lacerations to the skin. Deep wounds may affect the underlying tissue, including the muscles, body wall, and even bones. Although many dog bites occur on the neck first, they can happen on any part of the body. Injuries of varying degree can affect the head, limbs, chest, abdomen and more. Small dogs tend to have especially serious injuries after being attacked by a larger dog. If your small dog has been picked up and shaken by another dog, there may be neurological damage or internal injuries. If your dog has a bite wound, make sure you bring him to the vet as soon as possible. Dogs carry a lot of bacteria in their mouths, so bite wounds almost always become infected. Also, the traumatized tissue from bite would is more easily treated the first hour after an injury occurs. Waiting any longer means that wound treatment may become more complicated and the wound begins the healing process improperly. If your dog has an eye injury, you may notice squinting, excess tearing or other eye discharge, redness, and/or swelling. Eye injuries can quickly turn severe, so be sure to see your vet at the first signs of an eye injury. If caught early enough, many eye injuries can be successfully treated with medication. Injury to the cruciate ligament is one of the most common limb injuries seen in dogs. The cruciate is a stabilizing ligament in the knee. When it ruptures or becomes injured in another way, it causes knee pain and instability. Most dogs will hold up the leg when the cruciate ligament is injured. Some will put a bit of weight on the leg, but most cannot put full weight on it. Only a veterinarian can determine if your dog has a cruciate injury. 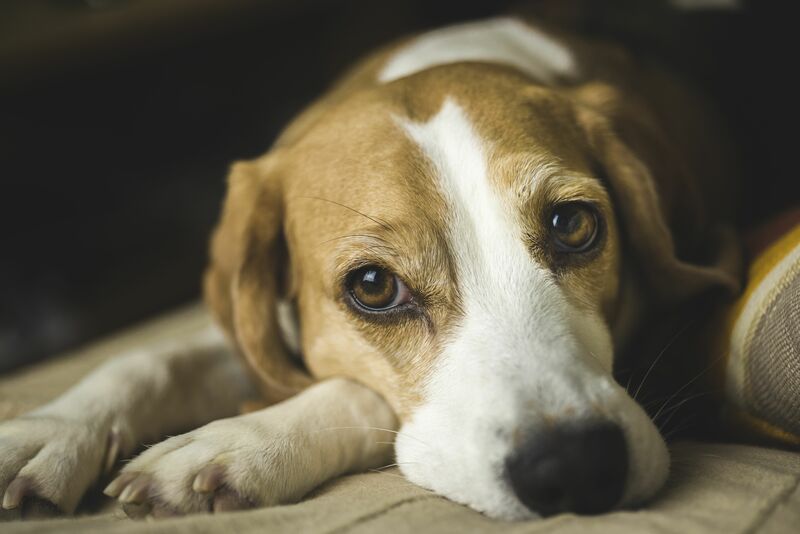 In some cases, dogs can recover with rest and medications. However, it is more common for dogs to need surgery to repair a ruptured cruciate ligament. Fortunately, there are several surgical options available, and the success rate is favorable. There are a number of injuries that may affect your dog's extremities. Most of these will cause limping. The severity of the limping usually tells you if you need to see a vet right away. After doing an exam, the vet may recommend radiographs (x-rays). Limping might be caused by a fracture of one or more bones in the legs or paws. Major fractures and joint dislocation usually look fairly obvious. However, minor fractures may not be as clear, especially hairline fractures that affect small bones or bones that are not supporting a lot of weight. A fracture is treated by stabilizing/immobilizing the broken bones. This may be achieved by placing a splint or cast. Or, surgery and placement of a pin or plate might be necessary. 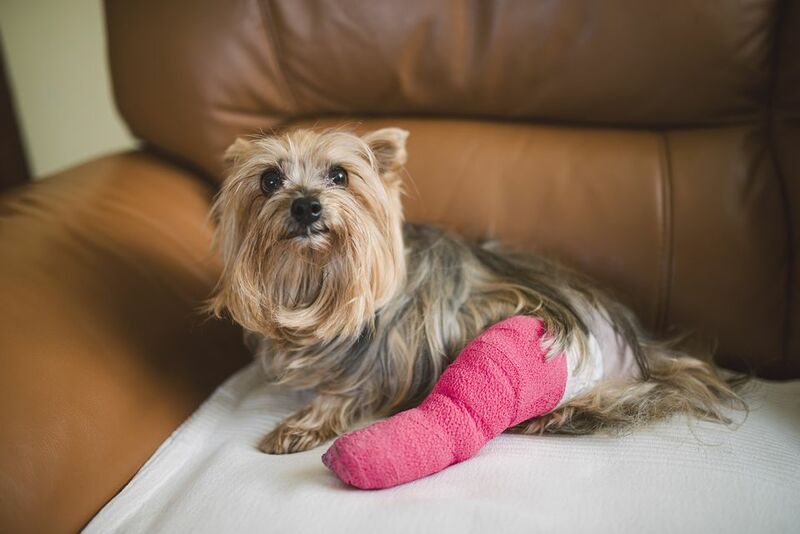 Your dog could have a soft tissue injury in the leg (sprained or strained a muscle). This often happens if your dog lands wrong after jumping or overdoes it while running/playing. Treatment usually involves medication and rest. More serious soft tissue injuries may require surgery. Spinal injuries in dogs range from mild to severe. Spinal issues may be brought on by ​minor or major trauma. Other simply occur because of genetic predisposition. Intervertebral disc disease is a somewhat common spinal issue in dogs. When a dog has IVDD, one or more discs in-between the vertebrae rupture, or herniate, causing disc material and inflammation to put pressure on the spinal cord. This causes pain and can lead to paralysis. Many owners report drunken gait or complete inability to walk (especially in the rear limbs). Signs may appear gradually or come on suddenly. In some cases, IVDD can be managed with medications and rest. However, more serious cases require surgery. Spinal fractures are less common in dogs than IVDD and typically occur with major trauma. In some cases, spinal fractures can be repaired surgically. When dogs have oral injuries, it is often because of something they were eating or trying to chew on. Bones, antlers, and hooves can cause injuries to the teeth, gums, tongue, and other soft tissue. Bones can become lodged around the lower jaw and canine teeth. Even chewing on sticks and twigs can result in an injury. It's not uncommon for vets to see dogs with sticks stuck on the roof of their mouths (lodged between the molars). When dogs fight, they may bite at each others' faces and cause wounds in the mouth. Minor wounds in the mouth, like scrapes and cuts, may be treated with medications. However, larger lacerations and tooth fractures usually require oral surgery. It's not unusual for active dogs to get cuts and scrapes. Wounds on the body might occur after a dog runs past a sharp object, such as a nail. Dogs often get wounds on their paws after stepping on glass, sharp rocks, metal, or other hazards. In some cases, the material becomes embedded in the paw pads or between the toes. If your dog is bleeding from anywhere on his body, it's best to get to your vet. A thorough cleaning is essential to flush out as much debris and bacteria as possible. A laceration repair (stitches) may also be necessary if the wound is large enough. If some material is in the wound, the vet may need to explore the site and remove it surgically. At the very least, your dog will need antibiotics to prevent infection. Vets also tend to prescribe anti-inflammatories for pain and swelling. Many dogs experience a torn toenail at least once in their lives. In the same way that cuts and scrapes occur, dogs can also catch a toenail on something and injure it. A dog may also catch a toenail on the grate of a metal cage. Sometimes, the toenail splits down the middle. Other times, the nail partially breaks off beyond the quick. Either of these scenarios is painful and may cause bleeding. In many cases, these dogs need what is called a "nail cutback." Vets typically use local anesthesia and/or sedation to prevent additional pain and relax the dog. Then, clean nail trimmers are used to cut the nail beyond the split and break. Sometimes, the nail must be cut down to the nail bed. The breeding is stopped and a minor bandage is applied. Dogs are usually sent home with antibiotics and anti-inflammatories for pain and swelling. To prevent toenail injuries, keep your dog's nails trimmed short and watch where he walks. Tail injuries occasionally happen to dogs. Usually, they are the result of some type of trauma. Your dog may accidentally get his tail caught somewhere (like a door). The tail may be bitten by an animal or stepped on by someone. Some dogs, especially large breed dogs, get what vets sometimes call "happy tail." This occurs when a large, heavy tail wags against a hard surface so much that it causes bruising and abrasions. These type of tail injuries can be difficult to treat. When the dog feels well enough to start wagging again, it is likely that he will re-injure the tail. Depending on the severity of the tail injuries, healing can take weeks to months and may require the use of bandages, e-collars, and crate restriction. In a different scenario, you may see that your dog's tail is flaccid and hanging limply for no apparent reason. This is sometimes called limber tail syndrome and may be the result of a minor sprain or strain. A flaccid tail is common after a dog has been doing a lot of swimming. However, it could simply be the result of excessive wagging. Limber tail syndrome usually resolves on its own after a few days. If your dog's tail is not getting back to normal after a few days, it's best to see the vet.